How to find proper Internet access in the first 3-5 days in a country, whereby you can stay in business and enjoy your location independent lifestyle. This page is to explain how to live anywhere, at any budget way of staying connected. When entering a new country all the rules change, moving from country to country is a constant challenge for those who want to travel and do business using the Internet as your primary communication tool. First Day off the Airplane: Business travelers normally stay in Five Star Hotels, and this is the easy and expensive way to guarantee you have continuous non-stop high quality Internet access in any country. This page is for those of you who leave the Hotel and find your own path. Three Methods to stay connected: The map above prioritizes which method of staying connected is probably going to work for various regions of the planet. A: This is probably the fastest option, and for those of you who need over 300-500 megs or upload / download per day, you may need to stay in A countries. How this works is you use Tether.com and to tether your computer to the a BlackBerry or Android for Internet connections the first five days. If you are using a Verizon Global Data Plan, you will be able to enter 220 plus countries and do this, it is possible that Vodafone sells this in Europe, but I am not sure. While you are on the Smartphone system, you will look for a WIFI ready to go Hotel, whereby you can set up base. If you are in need of continuous higher speeds, you will need to search the Internet continuously to be able to change Hotel, you MUST KNOW the NEXT HOTEL before you move. To alleviate the stress, you could go the central office of the cellular provider in a country and try to purchase a new USB Wireless Modem, making sure they configure it and instruct you on how to recharge the prepaid SIM before you leave. The last defense is to to go to an Internet Café, hopefully there are 24 hour ones in your area. B: There are countries such as Ghana where finding WIFI in the Hotel is only possible in the most expensive Hotels. Therefore again, you do the Tether system with your Smartphone, and go directly to the main cell phone companies as fast as feasible. 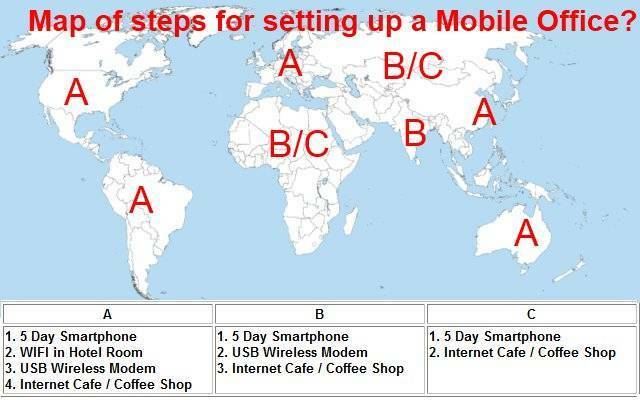 While on the Smartphone connections, try to search, find information, and walk into bars around the area looking for people using the Internet with a USB Wireless Modem. If you are lucky, you can make a good choice, 90 percent of the countries on the planet presently in 2011 have some form of wireless modem available. C: This is the tough countries, however, do not assume that some poor third world country in Africa does not have USB Wireless Modems. The cellular companies often supply better cell phone or USB Wireless modems in poor countries before they do in the rich countries. The poor countries never had wires, they did not have landlines and often made a jump past the modern countries with their cell towers. However, if you are in a country without USB Wireless Modems, you will need to be cautious, you are in the worst of the worst and the Internet cafés are probably the worst. Try to be the first one in the café in the morning and use the bandwidth before you are forces to share it with 5-20 other users. Note: Do you have Five USB Modems in your Bag, please contact Andy Graham by clicking on contact above with HoboTraveler.com. I want to discuss with you Mobile Office concepts, you are the 1 in a 1000 who may understand.